Sally Rippin's fabulous early reader series for young girls, Billie B Brown, has been a huge success with 5-7 yr olds from day one, so I'm a little shamefaced to admit, that it has taken me over six years to actually read one! In some ways I didn't need to - Billie B sold herself. Word of mouth in the local kindergartens was all that was required. The cute covers, catchy titles and slim size did the rest. But I now have a six year old, soccer playing niece who has just discovered the joy of reading by herself. It's so exciting listening to her sound out words and make sense of the jumble of words in front of her. 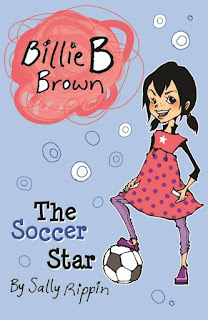 Billie B Brown: The Soccer Star was an easy choice for her recent birthday. In three easy chapters, Rippin introduces Billie and her best friend, Jack (who has now been granted his own spin-off series, simply called Hey Jack). With large font and fun illustrations by Aki Fukuoka, the beginning reader experiences success and satisfaction from start to finish. In The Soccer Star we learn what the B stands for in Billie's name and what her favourite sandwich is. We feel cross and sad and all muddled up, along with Billie, when Jack is invited to play soccer at lunch time, but she is told by the other boys that "girls can't play soccer." However nothing keeps a spunky can-do girl down for long! Billie comes up with a great solution to the playground gender problem, and with Jack's help, pulls off a fabulous, fist-pumping girl-power ending! There are 19 more books in the series to keep the most eager early reader happy for hours!